Momma Told Me: When the pie was opened, the birds began to sing. When I was a young girl, no older than 4 or 5, Momma would call me into her bed each night (thinking back my bedtime was probably 4 or 5 in the afternoon, but I digress) to read me a story from the official Grimm's Fairy Tales compilation. It was a large paperback book with more pages than any I had seen before, outside perhaps Merriam Webster's Dictionary, and out of the top smiled a Persian cat bookmarking where we had last dropped off. Now these weren't the colorful storybook fairy tales of traditional childhood, these were the unabridged, dark and brooding adaptations much closer to the originals. And, while some might question Momma's thinking in choosing to share these from such a young age, I assure you she always read ahead to lighten the darker parts. Naturally, as a little girl who knew that Disney's fairy tales and Grimm's actual tales were far from one in the same- that at the end of The Little Mermaid Ariel is in fact offered a knife to kill her beloved prince and return to the sea, and much like the modern Into The Woods feature film indicates the stepsisters in Cinderella did indeed cut off parts of their feet in an attempt to fit them into the Prince's slipper. Morbid as this may seem, my ultimate point is that fairy tales were never intended for children at all- many of the stories we have sweetened up with fairies and talking mice were in fact meant as cautionary tales to bored adults and the men and women of the king's court. So, while I wasn't about to craft any 4 foot pies with small animals inside, I was inspired to try my hand at a traditional storybook pie- Blueberry with a Winter comfort twist. I'll be honest, I've only ever used blueberries in scones, and never handled fresh blueberries (primarily because they can be so expensive,) so I was a bit nervous when I set out. I happened to have 2 deep dish pie shells in the freezer from the holidays (so I can't take credit for those) which especially motivated me to get in the kitchen yesterday and give this recipe a try. I'm no Martha Stewart, but there is something inspiring about working with fresh ingredients- watching the rich blue berries cook to a beautiful purple. Naturally, halfway through baking I remembered I didn't own a pie crust shield (hard to believe, right) and had to emergency tent my crust rim to keep it from overcooking. Thankfully that worked like a charm, a few scalded knuckles later. I was skeptical about the streusel topping, but 20 minutes cooling on the window sill, in true storybook fashion, and this pie looked picture perfect- no small animals harmed in the making! 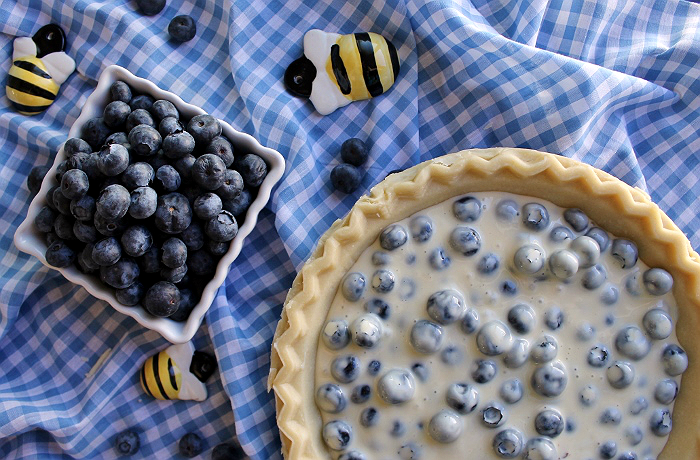 So try this Blueberry Custard Pie hot or cold (it was the biggest hit cold in our house,) and bake an extra to gift for a friend or neighbor- jut leave the birds out. As far as pie making goes this recipe's pretty straight forward, but the comfort level of a heaping slice does wonders after a long day. What was your favorite fairy tale growing up- what would you love to grab a slice and curl up while reading? What Daughter Says: This recipe is sure to put smiles on your guests faces, no animals harmed int he making. 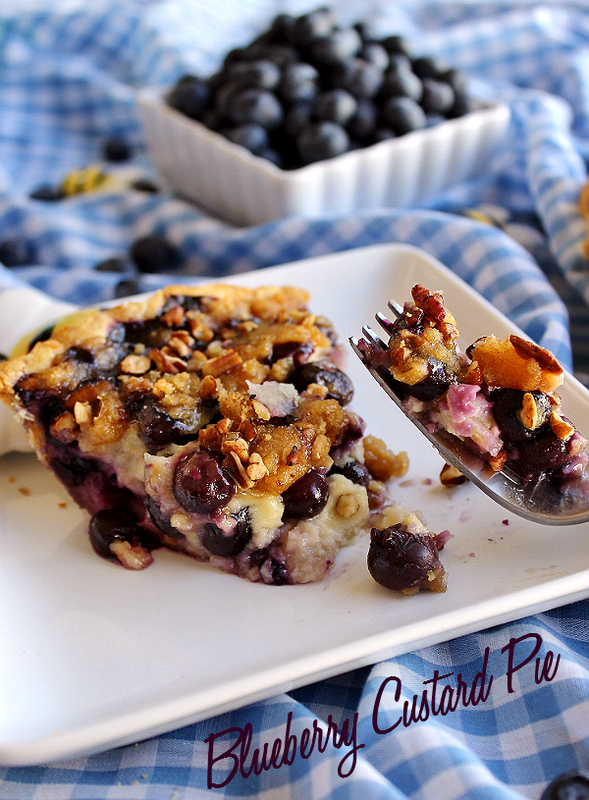 ***Click here for printable Blueberry Custard Pie recipe. 1. In a large bowl combine Sour Cream, 3/4 C Sugar, Egg, 3 TBS Flour, Nutmeg, Vanilla Extract, and Salt, until even. 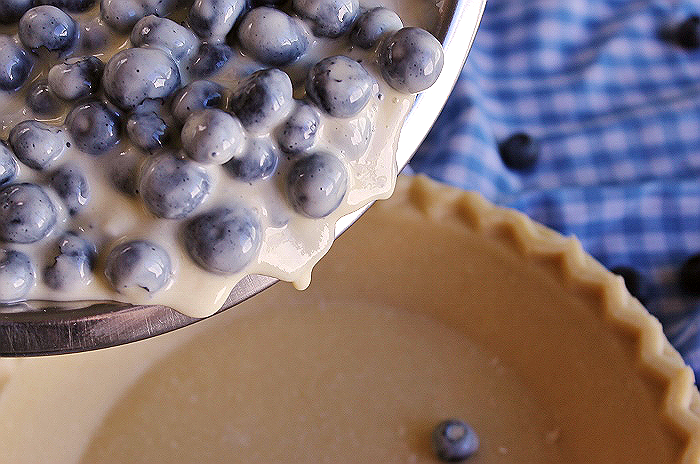 Gently fold the blueberries into the mixture and spoon the filling into the crust. 2. Bake in preheated oven, at 400F, for 25 MINS. 3. 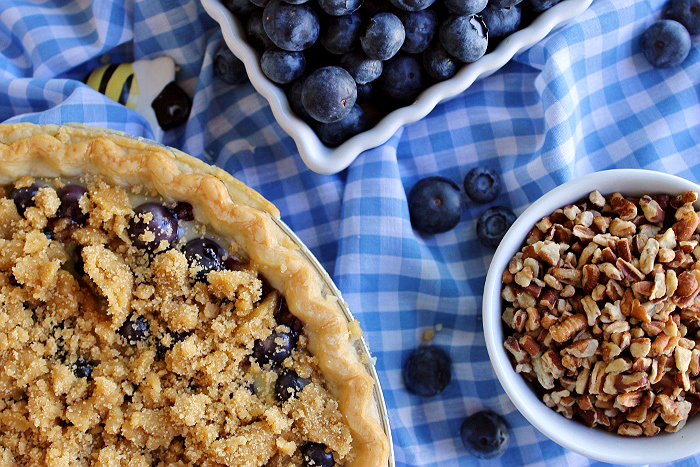 While the filling bakes, prepare the streusel topping. In a medium bowl combine brown sugar and flour. Cut butter into the mixture and combine with two forks in 'slicing' motions until even and crumbly (like sand.) Fold in chopped pecans and crumble over baked pie filling. 4. Return the pie to the oven, with a crust shield or foil crust tent, for 15-20 minutes, or just until topping begins to turn golden brown. 5. 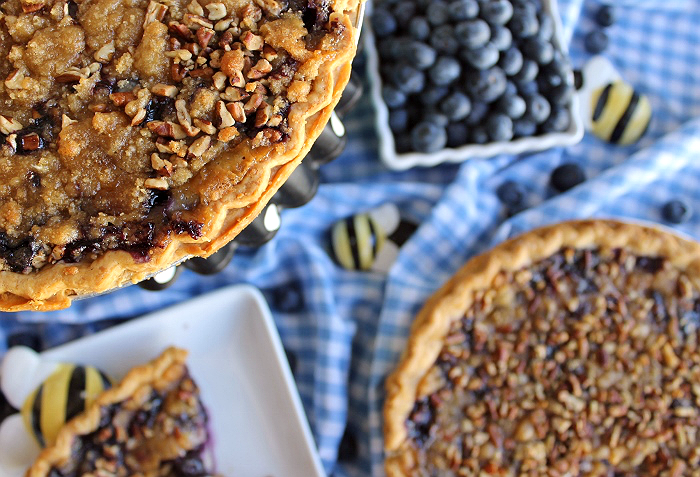 Remove pie from oven and let sit 10-15 MINS before serving warm- or chill and serve cold. Are you freaking kidding me? This looks SINFUL and I mean come on ... here I sit having a sweet tooth CRAVING something but not sure what and here you post this?! What are you reading my mind??? I need this in my life more than ... never mind ... 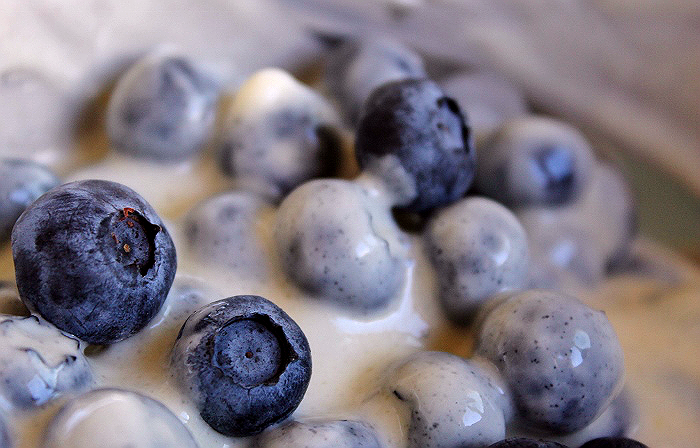 I mean those blueberries oozing with cream ... UGGGG Need! And oh yes the fairy tales hahaha not for the faint of heart but I think we have muddled them down over the years to sweet stories of happiness. Anyway I am going to read through this post again, so well written, so beautiful in colors and words. I just can't focus on it yet ... the visuals are too amazing. GAD now I have to go get dressed and go to the store and make this. I was always a sucker for Cinderella - the fairy tale version, not the Grimm version. I love to bake pies but must admit to not being a big fan of custard pies. The hubby on the other hand loves them so I'll make them for him. Blueberries are his favorite so I'll try this for him - although I have huckleberries in the freezer so I might make a small (wild) trade. Your pie is beautiful! If I had access to huckleberries (or marionberries) I'd pick those too- this time of year SoCal gets short on supply of fresh berries! 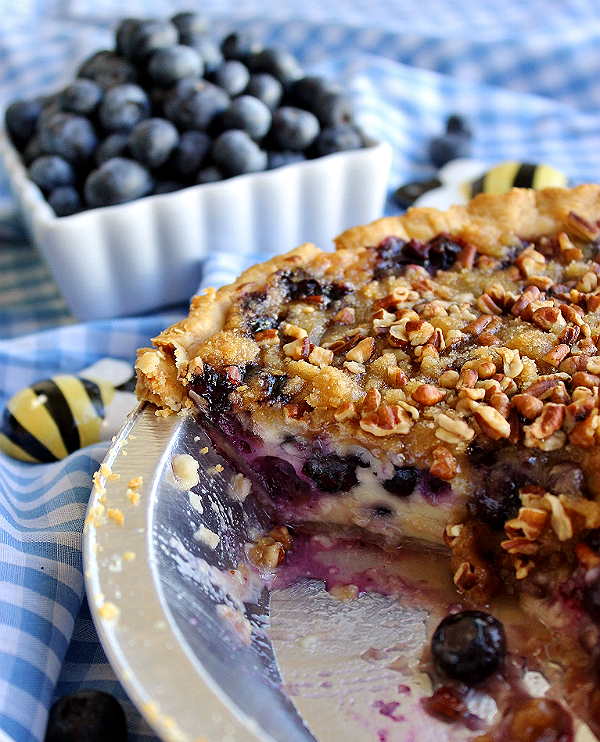 I make a blueberry custard pie too but it doesn't have the topping. I like the idea of of your topping as the pie doesn't look so anemic! I want to pin all of these - beautiful pictures. I'd like to bake a pie at some point. I am so excited to see Into the Woods, but I haven't had a chance yet. 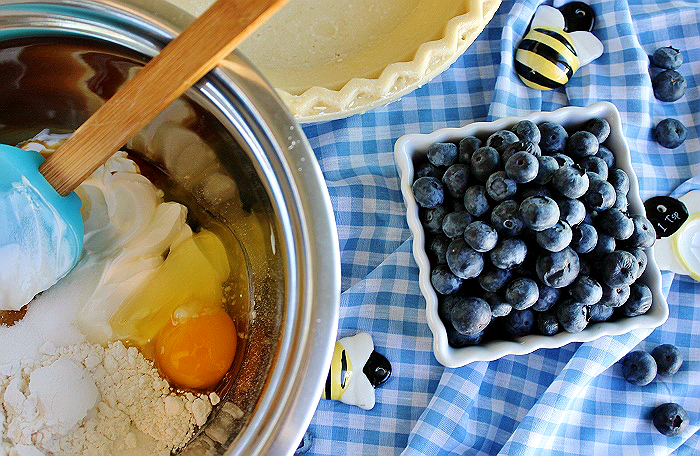 Your blueberry custard looks so delicious, I can't wait to make one and try it! I think I would prefer this hot after a warm, comforting meal. And then I'd like to wake up and eat some of it cold with a cup of coffee the next morning. It looks amazing! I just love anything involving custard. I can't wait to try this one! My mom was a big feminist when I grew up, so we did not read fairy tales. I do love a good blueberry dish to curl up with though. I had no idea about the fairy tales being so drastically different! 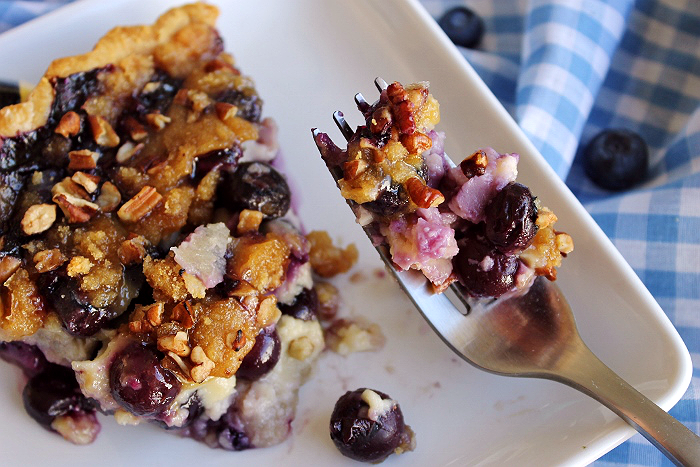 That looks amazing I love anything with fresh blueberries! I love anything made with fresh blueberries. It is amazing how different the fairy tales are now a days. Okay, that looks insane! I would probably eat the entire pie. So yum! My wife loves fresh blueberries. We try to cook with them when we can get a good fresh batch also. So good. That looks amazing. I just made my first pie a few weeks back and have been hunting new pie recipes to make. This is going to be perfect. My youngest would live on blueberries if we let him. This recipe looks awesome and I can't wait to try it. Perfect timing too since I saw blueberries on sale for $2/pint the other day. Wow, what a great price Daisy! I would make this pie every week if I could score them that cheap! 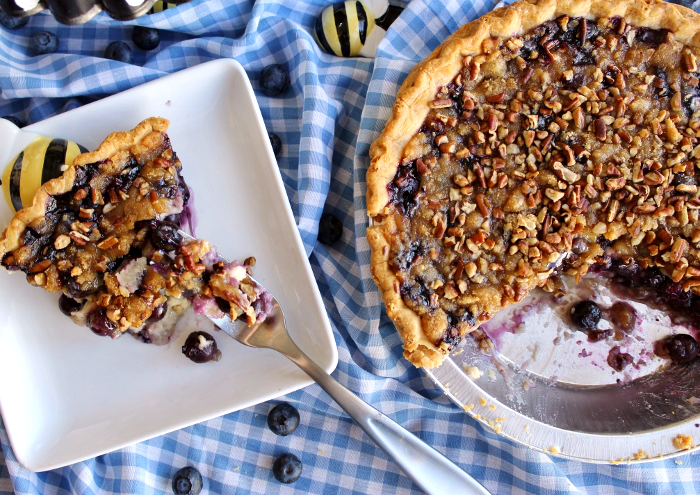 This blueberry pie is just dreamy, it's on my wish list in my kitchen!